A perfect blend of midtempo and more upbeat electronica, featuring artists such as Bullitnuts, The Verbrilli Sound, Baby Mammoth, Thievery Corp, Boards of Canada, Royksopps, and Ltj Bukem. Beat Blender will keep you awake but not stress you out. Available in both Mens/Unisex and Womens styles. Get yours now! 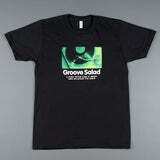 Support SomaFM and get the new Groove Salad v3 compilation! Groove Salad Volume 3: a compilation mix of some the most popular and classic tracks played on Groove Salad. The mostly instrumental tracks are a cross-section of the music you'll hear on Groove Salad: Downtempo, ambient groove, trip-hop, chillout and worldbeat.